Papers will be allocated approximately 15 minutes for presentation, with an additional 2-3 minutes for questions and answers following each talk. Session Chairs will introduce the speakers and will moderate the discussion. Each presentation room will be equipped with a laptop computer and a projector for PowerPoint presentations. The available software may also allow for other types of presentations, such as embedded videos. Laptops will have a USB port accepting USB memory devices. Presenters who wish to run specialized software need to bring their own laptop. Prior to their session, they should inform the session chair and test that their computer works with the projector in the room. MAC computers are also acceptable. MAC users must bring their own adapter to connect to the VGA cable or their own cable. Wireless internet connection will be available in the presentation rooms. The poster area will be located together with the Exhibition area at the ZEUS Hall. The posters will be mounted on poster boards (one poster per board - with portrait orientation) with blue tag or double sided tape (NO push pins) which will be available on site. Presenters can mount multiple single sheets of paper, larger posters, pictures, or any printed materials on the boards. Authors of posters are kindly asked to make themselves available during the days of the Conference to present their work and answer questions about their poster to Conference participants. It is up to the presenters to arrange the date(s) and time(s) they will be available. 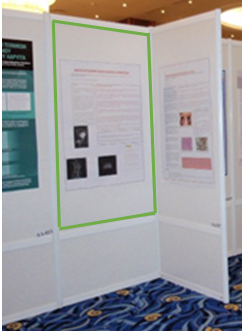 They may wish to indicate on the poster board when they will be available to provide brief presentations and answer questions about their poster to Conference participants.